I have another product review for you all! I wish I did these more often..But I haven't been totally in love or totally hated much products lately. Except this one..So excited! I've been trying to grow my hair out forever but it seemed like it was always stuck at the same length because my hair would grow a certain amount and then just split and I'd have to get it cut. I was on the market for some good products to help end this awful cycle and I finally found one! 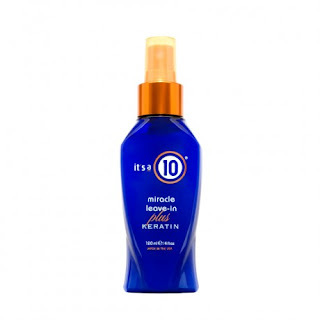 It's the It's a Ten Hair Care leave in treatment. I don' t know what kind of magical things they stuck in this but I had only been using it a few weeks before I noticed my hair feeling healthier and the split ends were almost completely gone! Another thing I really love about this product is that it makes my hair feel all glossy and healthy like it does right after I get it done in a salon. Love love love loveeee this product! I've told so many of my friends about it and even strangers. It's honestly that good. So go out and buy it. Now.